As a child, I loved the movie Pocahontas. A strong, brave, beautiful women from a rich culture standing up for peace and Mother Earth? Sign me up. To boot, “Colors of the Wind” is one of the catchiest Disney songs ever written. It was also one that puzzled me the most as a child: how the heck do you paint with wind? And where exactly did those wind colors come from? I love how he speaks of trying new foods in new colors for the fun of it. He likens trying new food to loading songs on an iPod: we’re always putting new, popular, exciting music on our iPods, why not do the same with our food, and use new, fresh, exciting varieties? The market in general was a smashing success, proof that even in January there can be plenty of fresh, local food to enjoy. 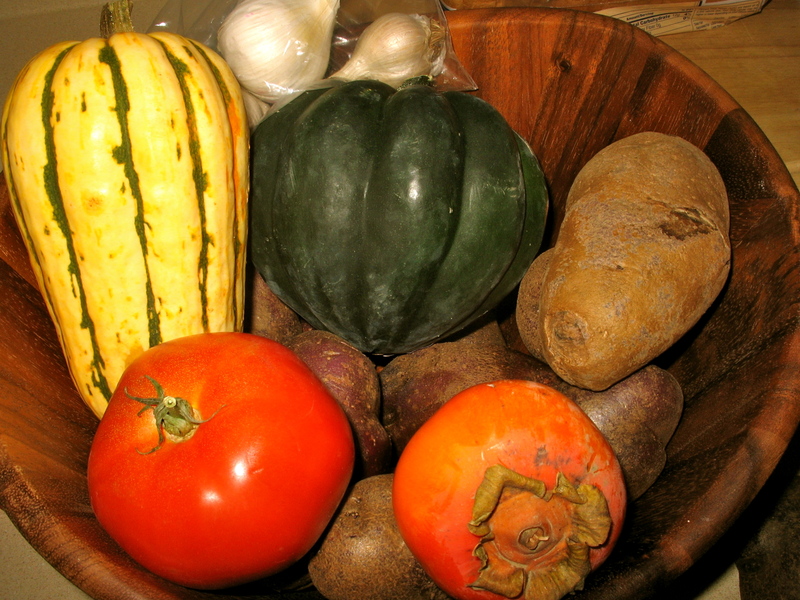 A very friendly farmer was more than happy to sell me kale, garlic, squash, leeks, and the crowning jewel, purple potatoes. I was giddy looking at my “colors,” feeling like I could paint the most delicious meal in the world with them. I refrained from singing "Colors of the Wind," much to BF's relief. Living out my inner child’s dream (who else remembers making – and perhaps eating – “mashed potatoes” out of different colors of Play-doh? 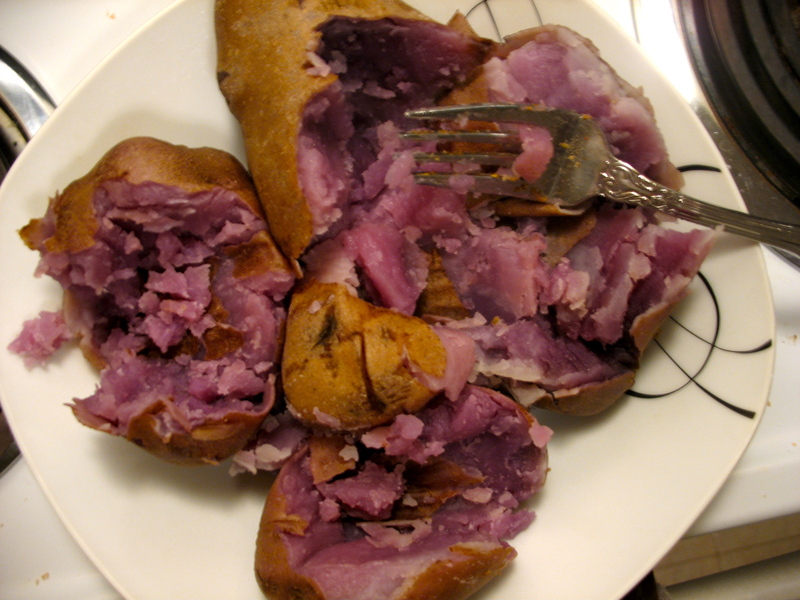 ), I boiled a pot and mashed my first ever purple potatoes. In fact, our whole dinner last night was super colorful. It was not only a delicious spread, but a visual feast as well: a mix of purple and green with a dash of red and some brown to temper it out. 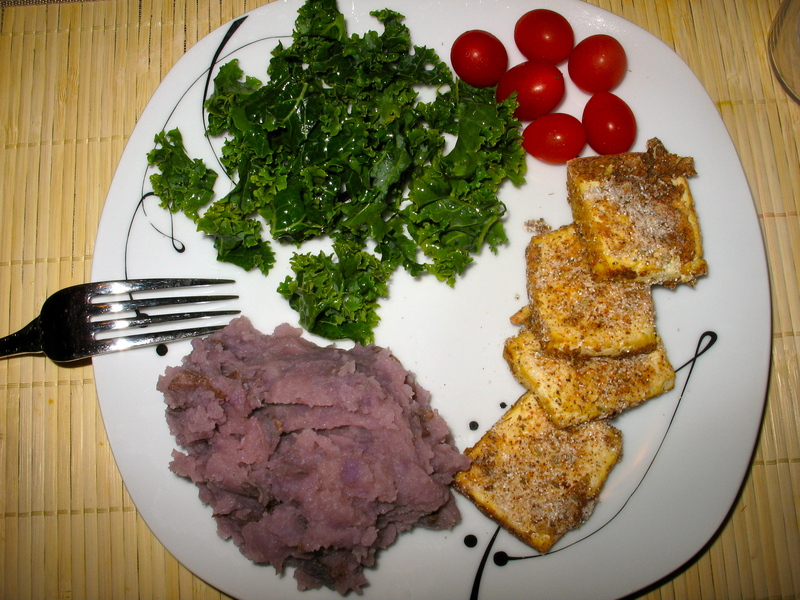 In the mix: breaded tofu, fresh kale massaged with a lemon vinaigrette, purple mashed potatoes (of course), and some fresh veggies on the side – cherry tomatoes, carrots, and celery. The meal, in addition to being colorful, also held three other surprises: it was vegan, it was kosher, and it was healthy. I’m always delighted when this happens. It feels as if all the little pieces of my food mythology move in perfect concert. Your turn: Have you ever tried a differently colored food? 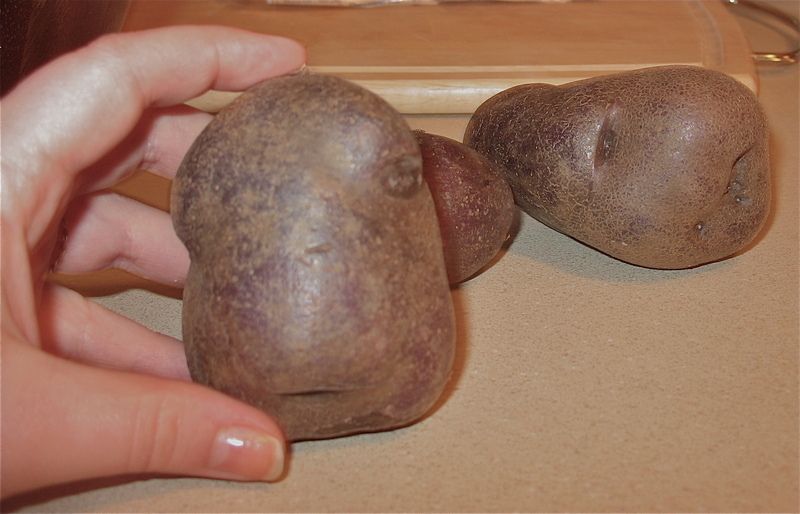 Orange or purple cauliflower, white carrots, or even (my new favorite) purple potatoes? What did you think?